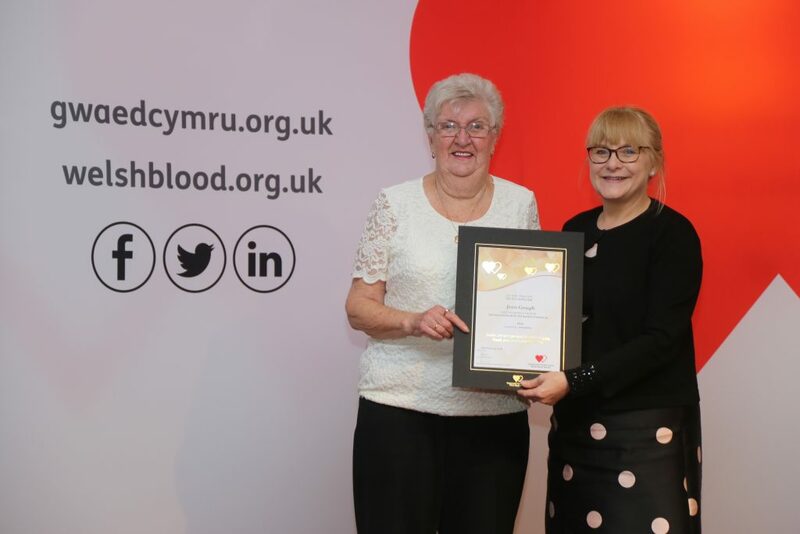 The Welsh Blood Service gave a special ‘thank you’ to 84 milestone donors at an awards ceremony in Swansea. Those in attendance were recognised for their continued commitment to saving lives in Wales. The Welsh Blood Service event was attended by 77 whole blood, one platelet and six bone marrow donors from Swansea, the Gower Peninsula and surrounding areas. Among those to be recognised were three local donors who had reached the highest donation milestone of 100 donations – enough to potentially save up to 300 lives. The donors recognised at the event had between them donated 4,981 units of blood, platelets and bone marrow. “I started giving blood as a dare! After making my first donation I discovered that I was O Negative – a rare blood group which can be used by anyone, including babies. After I found that out I was honoured to be able to help out. “Since I first started donating the rules around giving blood have changed – there used to be an upper age limit on donating, but thankfully they removed the upper age limit if you’ve given once before your 65th birthday so I’ve been able to continue donating. “It only really dawned on me at the ceremony just how much I’ve been able to help patients in need as each donation I made could have save up to three lives. In addition to whole blood and platelet donations, six individuals received awards for making a lifesaving bone marrow donation that has gone towards helping patients suffering from blood cancers such as leukaemia. “Six years ago a friend of mine was diagnosed with Leukaemia. After hearing the news I went to join the bone marrow registry to try to help. Although I wasn’t a match for my friend, she survived thanks to a bone marrow donor in Australia. “Fast forward five years and I received an unexpected text message from the Welsh Blood Service stating that I was a potential match for someone in need of a bone marrow transplant. “After a small blood test I was told I was the most suitable match across all the bone marrow registries in the world for a little baby boy in Italy. “The whole process was surreal because everyone kept telling me that I was saving a life, but you just feel like you’re doing what anyone else would do. I just kept thinking about how the parents must have felt knowing their baby needed this transplant from a complete stranger thousands of miles away. The Welsh Blood Service needs to collect 450 blood donations every single day to supply hospitals across Wales with blood for patients in need, and they rely entirely on the generosity of donors coming forward to save lives across Wales. To start your lifesaving journey, click here or call 0800 252 266.